I've recently been thinking about nail brushes (I know, I must have a lot of spare time!). I haven't personally used a nail brush for years and I began wondering whether anybody does actually use them. The only time I've used one was when I was much younger and I used to like helping my dad in the garden. But thinking about it, depending on the job you do I guess some people might use them regularly. I'm thinking along the lines of possibly dirty jobs, maybe like a gardener or mechanic, but also jobs where you really need to have super clean hands for hygiene reasons, like doctors and nurses. When I received a PR email listing some products they thought I might like to try I was intrigued by the Bruzz*, which claims to be the most hygienic nail brush in the world. The Bruzz is available in three colours (pink, blue and white) and I was pleased to receive the pink. Not that the colour makes a huge difference to anything, but we all like to have things in colours we actually like right? From the picture in the email I received I thought this was actually a ball, but once I received it I realised this was because the picture was taken looking at one end of the brush. Just like facial cleansing brushes have progressed from hair-like bristles to softer silicone bristles, it appears that nail brushes have now also made this progression. The bristles are anti-bacterial and can be removed so they can be cleaned fully. The Bruzz can be used on both natural and artificial nails and it's designed to clean both the nails and fingers. This is supposed to be vanilla scented but I find that if you actually give it a sniff it has quite a strong plastic type smell with a slight tinge of what you could possibly call vanilla at a push. Whenever I used a nail brush when I was younger one thing that I did notice was that the bristles were actually quite painful to use. My dad probably didn't notice this on his tougher bloke skin but on the delicate skin around my nails it was quite uncomfortable. 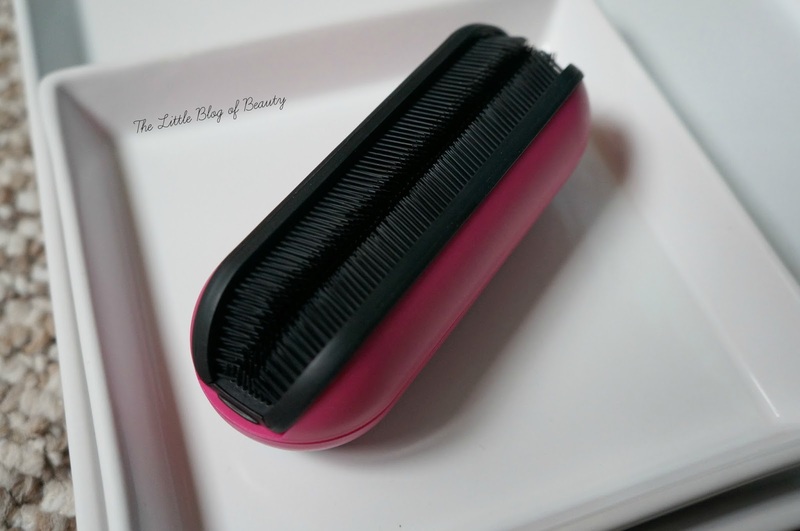 I've found that silicone bristles are much more comfortable and a lot more pleasant to use. Another thing that I noticed using nail brushes was that soap would end up flicking everywhere as you scrubbed. The Bruzz is claimed to limit spray and although I find there is still a little spray it's nothing like a traditional brush. Whereas a standard nail brush just has bristles in one direction the Bruzz has three sets of bristles that get the top of your nails, under your nails and the tips of your fingers. If you want to clean the pads of your fingers you just turn your hand and do each finger in turn. So it really does give a good all round clean. It may not be the most exciting of products but if you do need to use a nail brush for your job or you're just somebody who enjoys using a nail brush then I definitely recommend swapping your harsh bristle brush for a Bruzz. The Bruzz costs £9.99 and is available from Boots. Do you use a nail brush?